Founded in 1976 in France, Decathlon is present in 47 countries, has 1429 points of sale and 80 000 employees. Decathlon designs, manufactures, tests and sells its own sports products in its international stores. Our mission: sports are made accessible to everyone regardless of proficiency or discipline. The teams place the athlete at the heart of the process and prioritize the innovation of usage for ACCESSIBLE, IMAGINATIVE, PRACTICAL AND UNIQUE products. 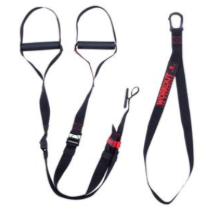 Decathlon product recall: Strap suspension, Domyos Strap Training 100 (product reference 8360619) purchased between January 1, 2016 and December 24, 2018. Teams from the Bodybuilding / Cross Training brand have found that the product did not reach the desired level of quality. Indeed, we have detected that, in very rare cases, the carabiner could break and cause a fall.